Take I-26 to 526 towards Mount Pleasant. Exit Highway 17 North. The hospital is about 6 miles up, on your left. Parking is free. 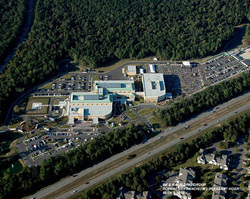 Labor and Delivery Location: Women's Services has a separate first-floor entrance just to the right of the Main Entrance, and the unit is located on the second floor. There are 6 Labor and Delivery rooms, 2 Cesarean Section rooms, 1 "swing" room, and 11 postpartum rooms. Each room is furnished with a rocking chair and fold-out sleeper chair. Juice, crackers, popsicles, tea, and coffee are usually available. TVs are in each room. Each MD has his/her own orders that state whether mom may have clear liquids (water, juices, popsicles, ginger ale, etc), ice chips only, or nothing by mouth. Again, each MD has individual orders. Most expect continuous external fetal monitoring, but it's good to ask a nurse what the doctor's routine admission orders state. Usually they have standing orders for a 20-minute initial strip then intermittent monitoring. We suggest speaking with your care provider in advance regarding these concerns. There is a Doppler available. A saline lock is usually done but it is not official policy, so it can be negotiated. What is the policy about microwaving heat packs? No official policy exists though it is polite to ask your nurse. If this is part of your birth plan that you have communicated ahead of time, the staff is quite supportive. Is there any mandatory separation of mother and baby? Is there a lactation consultant on staff? Yes. In addition, all staff are trained Breastfeeding Peer Counselors.